My obsessive collecting of serveware is becoming a small problem. I've run out of space in my kitchen cabinets and closets. All these plates are gathering dust as the stacks teeter on top of the refrigerator. 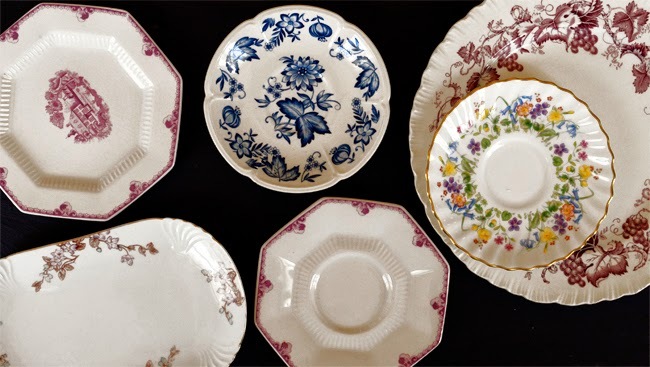 This "hoarding" behavior has left me with dozens of porcelain plates and platters, many of which I never use. Most of them were hasty purchases made at thrift stores, with a D.I.Y. project in mind. But, you know, life happens. And projects get swept aside for another day, another month, another year. Well, I finally got around to giving these plates the makeover I always intended with some acrylic craft paint and a few stencils and tape. The concept couldn't be easier. Just paint a new design on an old dish. The idea of painting over existing patterned porcelain isn't a new one, but it's a really great concept. I am in awe of how easy it is to transform an old porcelain pattern into something contemporary and fresh. My favorite example has to be these hand painted ant dishes by German artist Evelyn Bracklow. They are so realistic looking and creative, I want all of them! But I've got my own stack of plates that need attention, so I'll just paint those instead. I experimented with a few different stencils, but your success really depends on how flat the dish surface is. 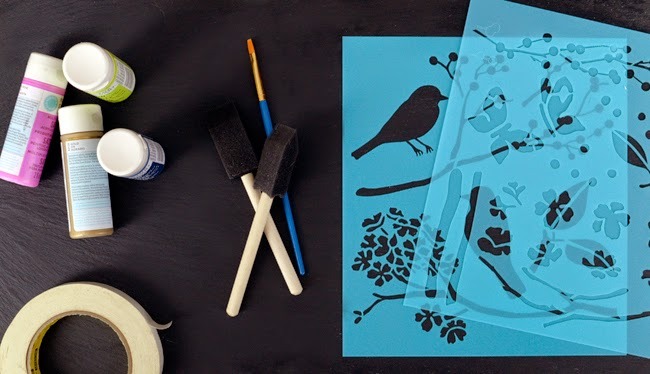 Most craft stores have a bunch of stencil options. I liked the Martha Stewart ones, especially this peacock feather silkscreen. Now, trying to paint clean lines on a dish with a curved surface isn't easy, so you'll have to practice a bit. But I had no problems with the taped designs. In fact, I prefer the simplicity and clean lines the tape provides. 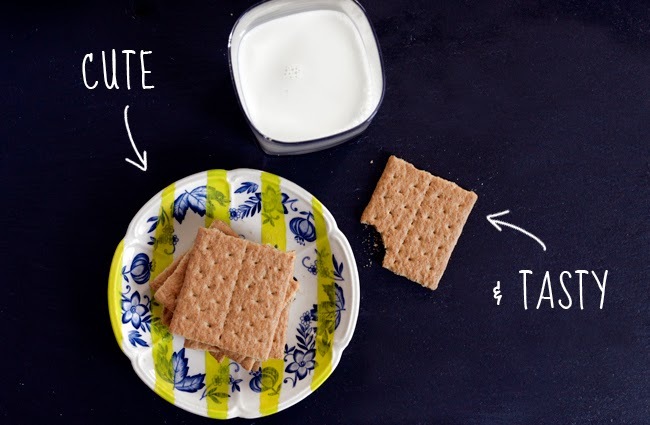 Just create a simple pattern with the tape and make sure the edges are sealed tight. 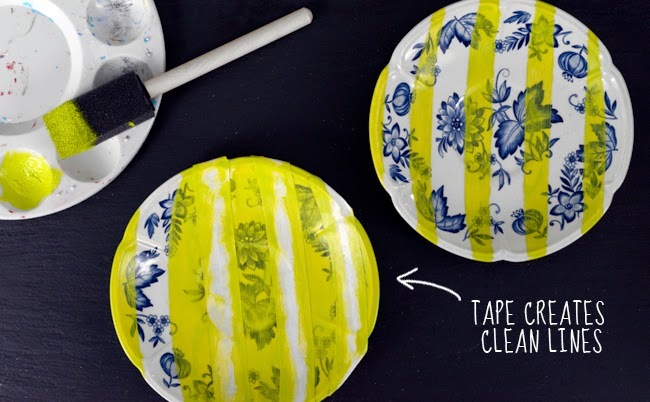 Once the paint dries, carefully pull up the tape to reveal your pattern. Here, I tried simple stripes. I love the way the original blue floral pattern peeks through the vibrant yellow neon, but you could add more coats for an opaque finish. 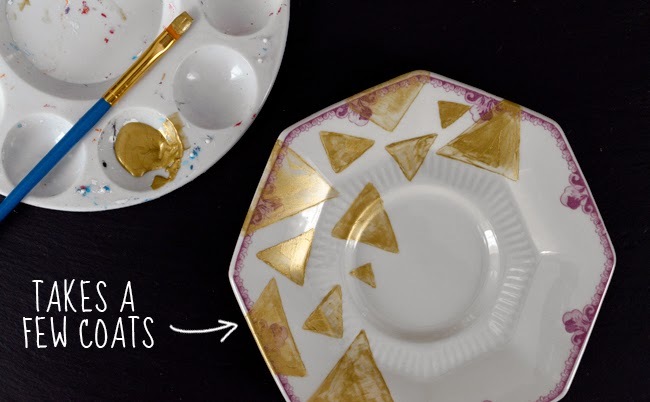 This triangle pattern was painted free-hand with gold paint and a fine paintbrush. 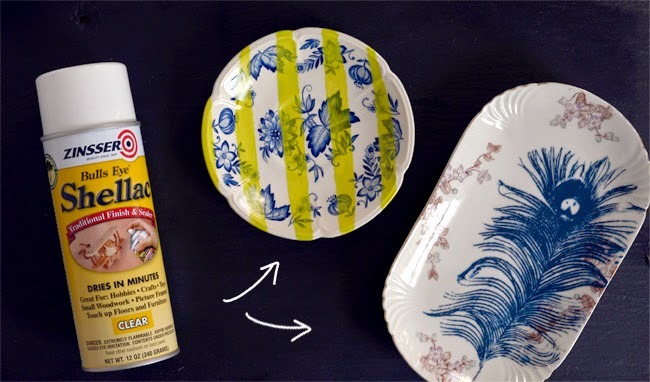 To seal the paint, spray an even coat of food safe shellac on the dish. Let the shellac dry completely before using, and only wash them by hand. 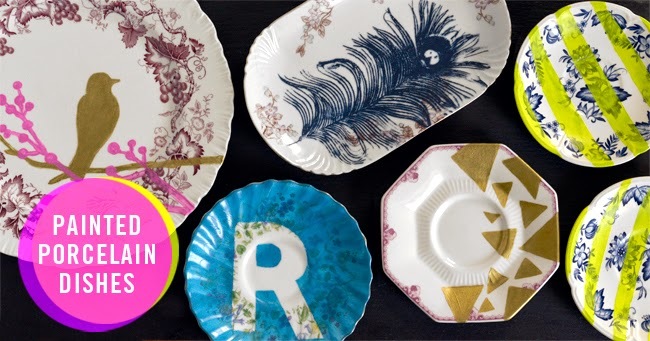 Mix & Match your dishes, gift them, or even arrange them on the wall as art.